Here are some tips regard restricting Internet access for specific applications on Android devices. Nowadays the usage of Internet is popular in both developed and developing countries. I heard some countries provide 100% free Internet with Wi-Fi facility without even password. But in other countries, we should pay much money to get internet access. The popularity of internet and the higher use of messengers like WhatsApp, people still connected with Internet in their entire life. Due to this reason, network providers increased rates for Internet plans. Most of mobile internet offers are for 1 Month with 1 GB, but we recharge same offer many times in a month, because 1 GB is not enough to us. In smart phones, especially in Android devices, the active applications steal our internet data for their automatic software updation, message content updation, etc. 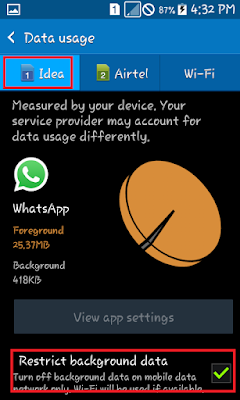 So we don’t get any idea about this type of mobile data stealing and we can’t control this type of data usage. In android device, we can analyze the usage of data including how much data used, which are the applications those used much data etc. If we can stop this kind of background internet usage, then we can save much data.Here are some methods explain how to prevent getting internet access for particular application which use much internet data in background. There you can see the internet data use on recent months, total data used, application wise data usage, etc. If you want to restrict background internet access for any application, then just select and open the application from the data usage application list. For example if you want to stop getting internet access for WhatsApp, then select WhatsApp, then scroll down, there you can see a check box with ‘Restrict background data’. Now your application can’t access the internet even your mobile data is ON. If your phone support dual SIM, then you need to provide separate setting for both SIM cards. If you want to restrict background data for all applications, then in 'data usage', take the option there you can make a check to ‘Restrict background data’. This method only prevent accessing internet at background, if you open that application, then app will start to access the internet, but can’t access at minimized state of the apps. You can’t restrict data access for restricted applications if you are using WiFi for internet access. All these applications support restricting internet access for any applications not only with mobile data as well as in WiFi mode. 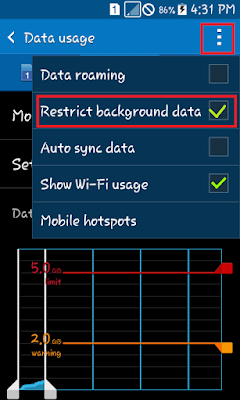 You can make restriction for mobile data and wifi separately. Also application never access internet if you even open the application.